Imagine you’re about to release a brand new trailer for a movie you’ve worked on for three years, and days before, a story is released that says the team behind your movie... may not actually be behind your movie. That happened to writer-director Alex Garland this week for his new movie, Annihilation. 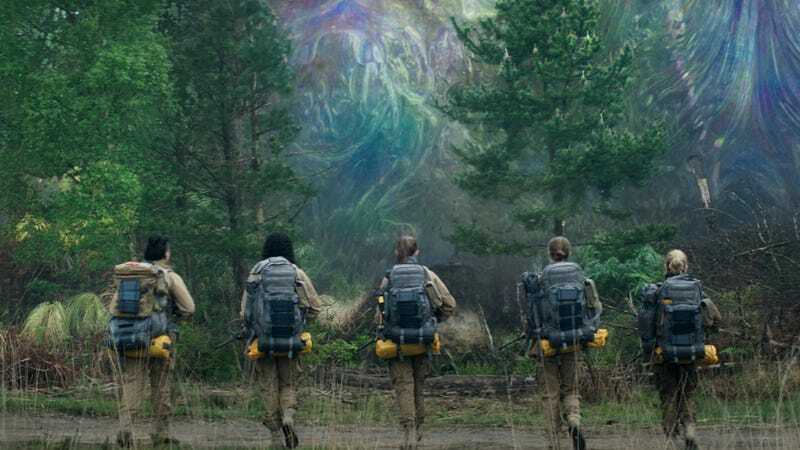 The film, which stars Natalie Portman, Tessa Thompson, Oscar Isaac, Gina Rodriguez, and others, is an adaptation of a heady, difficult scifi novel by Jeff VanderMeer about a group of scientists exploring a mysterious phenomenon. However, reports came out that producers clashed over the whether the film had enough mainstream appeal. Now, in an effort to mediate the dispute, Paramount will only release the movie theatrically in the U.S., Canada and China. Everywhere else, it will be on Netflix . On the other hand, Garland also knows that his movie isn’t an easy sell—like, at all. This is a fact you can see quite clearly in the new trailer, which is filled with mysterious, unique visuals that stem from a scary place called Area X and an even scarier phenomenon the movie calls the Shimmer. Descriptions like that make the trepidation toward his film easy to understand, if not actually expected. But, mostly, Garland is struck by the timing. The feeling was similar way back at the beginning of the process. Garland read the book before it was released and loved it, but had no idea how an adaptation was possible. One of the biggest changes is that the characters have names in the movie. In the book, they’re only referred to by their job title. That also goes for the simple fact that, in a book, an author can leave something open to interpretation and the reader fills in the blanks. But a movie has to show things. So Garland and his team had to define what the Shimmer and the creatures and things within it look and sound like, which always risks alienating readers who envisioned something else. No matter what, Annihilation was never going to be for everyone. Annihilation is out February 23, 2018. Watch the new trailer below. *Correction: An earlier version of the story said that the film was on going to Netflix everywhere internationally. In fact, it will get theatrical distribution in Canada and China, as well as the U.S.